Click the button Send report by email to send us the error via your email program. This mail does not contain any personalized information or database contents, except your sender email address. This allows our technical staff to contact you directly and to solve the exception in direct collaboration with you. You can, of course, also contact our support directly in the usual way. 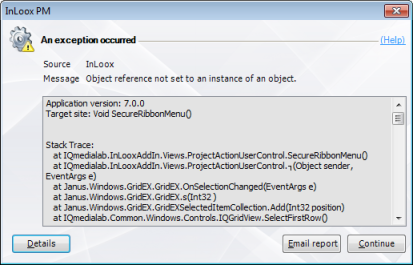 Please make sure to have the contents of the exception dialog box to hand. For more information on how to contact the InLoox support team, please see Contact the InLoox PM support. 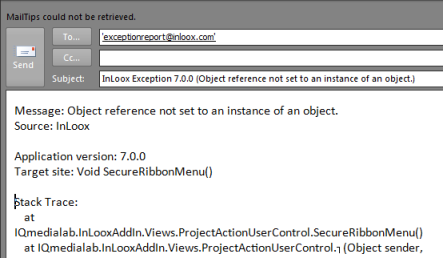 How to Report Exceptions in InLoox PM 7 • Copyright 1999-2019 © InLoox, Inc. All rights reserved.